I absolutely love the Red, Black and White color combo!!! Just like in the block, I used my favorite Grunge Basic in Red, but used two different shades alternating the two shades in each blocks to give the quilt a cool two tone effect. the blacks and whites are prints from Zen Chic's Modern Backgrounds Ink and Paper. I love how this block comes together to make such a fun secondary design. Sometimes I see the Red hearts coming together, and other times I see the white X's and black lattice. So fun!!! It really does have lots of fun movement. When it came time to quilt, I decided to go with a beautiful big all over swirl. And just like in this quilt I shared last week, I went with a gorgeous Red Fox #469 So Fine #50 Thread !! I just love the way it blends in the red and pops on the black and white!!! And one lucky Happy Quilting reader will be getting the Royalty Block pattern as well as 99 other amazing block patterns in Volume 12 of Quiltmaker's 100 Blocks!!!! And be sure to pop on over to the Quilty Pleasures Blog for lots more 100 Blocks Posts, Eye Candy, and of course, awesome Giveaways!!! At 12 am today (noon) there'll be one minute's silence for the victims of Paris. Hope you all think about them! Congrats on your block making the volume 12 issue! Congratulations on being in volume 12. We are now in the eleventh of the 12 months of the year. 12 minutes past my bedtime! Thanks for the giveaway. Counting my hubby and myself, our children and grandchildren...we need to set the Thanksgiving table for 12...the wonderful men and women who married into the family will have to eat with the horses, no room for them!!! Wow great block! Cannot believe they are up to issue 12 already! 12 days of Christmas is coming up fast!! Love your block! thanks!! I wish I had 12 girls in my Girl Scout troop instead of 11 as it would so much easier when splitting up into teams. Love your block and finished quilt too. There are less than 12 days until my son comes home from college for the first time--I need to clean the quilts-in-progress off his bed before then! Fun block--thanks for the chance to win a copy of the latest 100 blocks mag! What a great block, glad it made it into volume 12. In 12 days everything will be ready for the 1.of Advent in our house....lol! How ironic--there are 12 comments ahead of mine! Maybe I could make 12 blocks using the 100 Blocks book! I love that Quiltmaker is up to volume 12 and the designers are still going strong! Hmm ... 12 donuts makes a dozen. That sounds yummy. Of course I would share. Keeping my fingers crossed. Hmm I have no 12 fact, tidbit, saying, reference. But I love this block! It looks beautiful as a whole quilt. Sometimes I wish I had 12 fingers instead of 10. Would make some things easier (stranded knitting for example). Well, really I am happy with the 10 I have. Wish they were longer and more elegant instead of the stubby ones I have however. I haven't looked at any of the 100 Block books, but I'd be happy to start with volume 12! Beautiful block! Congratulations on being chosen for Quiltmaker's 100, Vol. 12. How wonderful to have a block included in Vol 12, and such great variations to turn it into a quilt. Volume 12, I really need! Cool block. The 12 Days of Christmas will soon be upon us, so I better get sewing!!! Congrats on getting your block in Vol. 12, it is a great block. I could see it in many sizes actually, imagine it much larger using only 1 of them to make a neonatal quilt at 36". Congratulations on your 7th block being published - Volume 12 looks great. Nice choice on the grunge and modern background fabrics too! I love 12" quilt blocks in 12 bock quilts...that's the perfect size for baby quilt donations! Congrats on making it into issue 12 Melissa. Gorgeous quilt! I have twin girls who are in their last month of being 12. Teenager-hood approaches. Hold me. I have 12 UFO's to work on today!! I follow you on Bloglovin, and read every post!! 12 of your blocks would make a beautiful table centre. Forever will I be a 12. Go Seahawks! Love your quilt, Melissa! Thanks for joining in on the blog tour with Quiltmaker. We appreciate it! That is a great block and quilt! I love the two shades of red! Does the block finish at 12 inches? I'm not sure if I have all 12 issues, but I'm close! Beautiful block!! Wow! I must have at least 12 UFOs ! Why not get ideas for some new projects! Congratulations on having your block in volume 12!! Congrats!! And omygosh in 12 days it will be Black Friday! Well, I'm pretty excited about this 12th issue of fabulous new blocks! Yours is inspiring and it makes into a gorgeous quilt. Thank you for designing for Volume 12. Congratulations on having a block in Issue 12! I love your color combination, it's one of my favorites, too. Clever name for your quilt!! Congrats on making it into Vol. 12. Hope you appear in many more to come. I will be sure to look for the magazine--then I will have all 12 issues! Congrats on your block--it's very fun! I learned to see when I was 12. Thanks for the chance. i love making 12 inch quilt blocks. 12 months in a year. How many quilts can we complete? Your block and quilt remind me of the 12 days of Christmas! Lol, I have Christmas patterns on the brain and this beautiful block looks like poinsettias to me...hmmm, thinking this might work very well for a Christmas mini! It's 10:12 AM. ;) Great block, Melissa! I like the sewing tip on Day 1 of the blog tour where it is suggested that for piecing, the stitch length should be 12 stitches per inch. I will need 12 place settings for Thanksgiving dinner this year. Thanks for the fun giveaway! I will need to make 12 of these very pretty blocks to make a great throw quilt! Thanks for the giveaway! Could I win this quilt, too? I mean, I was the Queen of Hearts for Halloween, all stitched up of my own design. Um, I wish I had 12 hours to go through all of this blog hop but instead I need to spend at least 12 hours today cleaning my house. it won't happen but a girl can dream. Dreaming is easier than cleaning. I just finished 12 blocks to make a nice throw quilt. Your block is great. I always like 12" quilt blocks, and it's fascinating to see the secondary designs that emerge when the blocks are put together. Thanks for showing yours, and for the chance to win. I love these 12" blocks... your is tops!!! I am keeping my fingers crossed in hopes of winning volume 12 of the 100 blocks magazine. Congratulations on getting your block featured. the year is quickly coming to a close, the 12th month is almost upon us and I have not finished what I had hoped to finish for the year....slow down....I did! 12 issues already, this one will be on my list! I'm excited to see Volume 12! Congratulations on having your block in it. I would love to win Volume 12! I love the use of the varied black. I'll bet the geometry fabric might have the number 12 somewhere. 12 minutes of uninterrupted quilting! I have made 12 quilts as gifts since I started this quilting adventure. Your block is great! This quilt would work in a 3 x 4 block setting as well for a total of 12 blocks. I love the idea of a block of the month or 12 blocks per year. Makes a project seem manageable. 12" blocks go together so fast - thanks for the chance! Lovely quilt with all those 12 blocks or should I really say 16 since it contains 9 full blocks, 12 half blocks and 4 one quarters of that block design. Love the fabrics you selected for it too, just beautiful! I'm already making a goal to make 12 quilts this coming year. I'm sure I can find lots of inspiration in the new volume! Congrats on your achievements! Congratulations on being published in Volume 12! 12 months a year, I love reading your blog and seeing your work!! Congrats on your block! I'd love to make a version for one or more of my parents' 12 grandchildren. My quilting ancestry began with my grandmother who lived in rural south Alabama. She hand pieced and quilted with whatever she had on hand...flour sacks, leftover clothing fabrics, even polyester when it became a fad. My family moved near her when I was fifteen to a small place my Dad fondly called Twelve Oaks. Mother hand pieced and quilted as well as sewing all my clothes and shirts for Dad and my 5 brothers. I found four quilt tops in her stash after she passed away, which is what started my quilting passion. Your quilt is quite nice! BOM programs always have 12 blocks, but last time I wanted it bigger and did it for two years! At the end I had 24 blocks, which I couldn't lay out in a way I liked so I had to make an extra for a 5x5 layout. How wonderful to be included in this book. I appreciate your offer to give one away,thank you. I just love this Queen of Hearts quilt so much. Wonder if I am going to make a smaller version using only 12 blocks. Congrats on your block and being a part of this awesome book again. You are one busy quilter, indeed, and always looking forward to your blog as well as your creative designs. The 12 days of Christmas! Your Queen of Hearts quilt made with Royalty block is wonderful! What a wonderful block. Volume 12 is going to be great. Congrats on being chosen. Your Queen of Hearts was born in Volume 12 and this Queen of Hearts (me) was born in month 12. It must have been meant to be......Royalty must stick together!! If there were 12 days in the week aid have time to try all these great blocks. I wish I had all 12 issues. Great block. Volume 12 looks great! The Royalty block sure makes for a great One Block Wonder quilt! It's hard to imagine there being nine-nine more blocks in this new issue # 12 of Quiltmaker's 100 blocks!!! The best month of the year is December, the 12th month. Your block is great. Great block! Congrats on being in Vol. 12! I love your block - it is just my style! I can't wait to get this new issue. I think I have all of the previous ones. Thanks for the chance! There are 12 months in a year and with volume 12 you have plenty of blocks to pick from to make a year long quilting project. When I was in high school I worked in a donut shop. Counted to 12 many, many times each day. Congratulations Melissa. Your block is packed with #CreativeGoodness. Great job. I like blocks that finish at 12 inches. Wow! That looks liked a version of Patchwork of the Crosses! Wonderful! If I had 12 of these blocks I'd make a wall hanging! 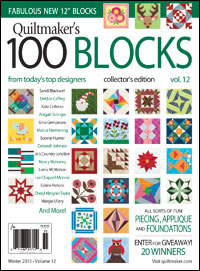 Thanks for a chance to win Volume 12 of Quiltmaker's 100 Blocks. I am not ready for the 12th month of this year! ;) Thank you! Very cool block, Melissa! The secondary design is great, too! The colors remind me of my favorite team in the PAC-12, Utah! My birthday is October 12. I'm with Amy--not ready for the 12th month! Awesome block and quilt I'd love to make this someday. It's hard to believe we're already almost going into the 12th month. The 12 Days of Christmas is one of my favourite Christmas songs. It wont be long before we start hearing them again in every shopping mall. it's 2 below today this morning ... it was down to 12 yesterday, and I thought that was bad. time to be inside, toasty, and working on the 12 projects I've got stacked up. I would love to have 12 of these blocks in a quilt...love your block!! I love your block. It is very versatile. I can imagine so many possibilities with it! On my way to pick up volume 12! Another beautiful block entry for this issue! Wow - 12 issues of 100 blocks already - that's awesome!! 12 is the number of people in my family that includes my husband, our children & in-law kids. Congratulations on Queen of Hearts being in Vol. 12! I have 12 minutes before my big pot of homemade chicken soup is ready....YUM! Love the red, white and black coloration on this striking block. My grandson was born on 12/12/12 -- how's that for a birthday! We're all looking forward to the 12 Days of Christmas! Love the creative comments. My favourite month is number 12, because it contains Christmas. So glad volume 12 is now available. Great block! Great block - thanks for sharing. I retired 12 years ago, though I went back to work part-time after only 3 months. But I'm enjoying semi-retirement. More time to quilt! I would love to make your wonderful block from Volume 12. 12 is not a bakers dozen. Thanks for the chance to win. Love your block. Volume 12 snuck up on me. I didn't realize it was coming out until I saw a mention of it - just yesterday. I like a lot of things about your block - its name, the colors, the Grunge fabric (I'm a fan) and the secondary designs it makes. I'm looking forward to getting a copy of the magazine soon! Would love to win volume 12. Your block is great and I love the black, red and white combination too. I can see making a cute quilt with 12 of those blocks. Very pretty. I'd love a copy of #12. Here's my anything with the number 12. I love making 12" blocks, and putting 12 of those blocks together, and having 12 borders going around . . . do I get extra credit for more 12's? lol! 12 must be your lucky number. Who knows, maybe it will be mine too! Thanks for the giveaway. Congratulations on making it again. I love the secondary design when using that block. Our son and his wife have 12 children. 12 is the age of my granddaughter! Love your block and the title for it is perfect! Thanks for a chance to win. I've made at least 12 baby quilts for my husband's coworkers. This block would be great in the next one! I love making 12 inch blocks! Love your block! I'm working hard to be able to wear a size 12! I really like the Queen of Hearts quilt! My daughter was born on March 12. 12 inch blocks are among my favorites to piece. Your block and quilt are gorgeous. Thanks for the chance to win. I wish there were 12 more hours in the day so I could have more time to quilt! 12 months in a year! Where did the time go? I can't believe there are 12 issues of this magazine out now! It doesn't seem that long ago that I got the first one,...Congrats on having a block in this issue, too! If I am very lucky, I will win Issue 12 and make these great blocks. Also, I bought 12 eggs today! I'm 12 times happy about your block! Your block and quilt are fantastic. I was 12 when I had my first Slumber Party - remember those? I love 12" blocks. When I first saw the block, it reminded me of English paper piecing. It is amazing. Thanks for the giveaway. I do love doing "alongs" that are spread over 12 months--a small monthly effort results in a single large finished project. I have more than 12 projects waiting to be done. And some of them are monthly. It takes me more than 12 days to design a small project. More than 12 hours to complete. More than 12 minutes to post to anything and more than 12 seconds to realize I like it too much to give it away! I just finished a quilt from a pattern calling for 12 blocks. I made made 30 blocks instead. Thank you for a chance to win Vol. 12 of the Quiltmaker's 100 blocks magazine. I look forward to checking it out since the first 11 have been so great. 12 in blocks are my favorite size. My brain works that way. In 24 (2*12) days, it will be my daughter's birthday. Thanks for the giveaway! 12 inch blocks are my favorite size. It would be awesome to win this book! I don't have 12 kids, don't have 12 grandkids, do have 12 chickens/roosters, and much more than 12 ideas of projects to make! Wow, I can't believe they're up to issue #12.
my 12" square ruler is my favorite ruler to use and square up my blocks! 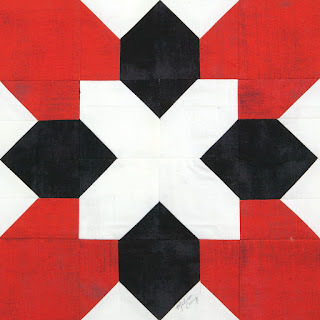 Love your black, red and white block great movement in your quilt. I have been following your blog for over 12 months now and I still think it's GREAT!! What a great quilt Melissa! It would make a great gift for my son, who will be 12 next year ;) Thanks for the chance of winning the mag. 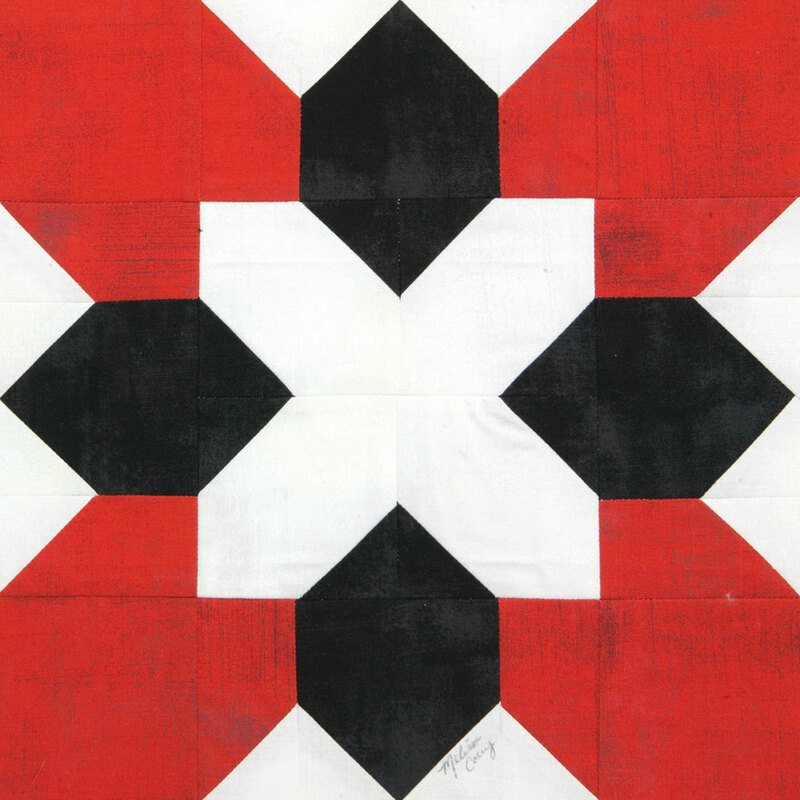 Love red, white and black quilts. Glad to see your block made it into volume 12. I love to quilt 12 months of the years. There are 12 months in a year! That's the primary teacher in me! Each one great for quilting! Gorgeous quilt! Love the dual patterns in it!! Would love to work on these blocks throughout the 12 months of the year! What a great block and a stunning use of it! And my birthday is in month 12, and the magazine and pattern would make a great present! I love how the two tones of red add the depth to it, without screaming "two tones of red here!!" 12 thumbs up! Congrats on being in volume 12! Soon the 12th month is upon us! Oh I love it all, candles, swedish saffron buns, advent lights (get them at Ikea!) and wreaths! I think I like the preparation time more than Christas Eve actually, but don't tell anyone! Red White and Black is so classic! Nice block to play with the colors. I have been trying to do all 12 Bitty Blocks, and am now on June, #6. All I can think of is 12 eggs in a carton... I must be hungry. Great block, and loving and the red and black. If you made one of each of the blocks in Vol.12, you would need to make 8.3 blocks in each of the 12 months. Fabulous block and design,Congrats on being published! What an intriguing design! Thanks for the giveaway opportunity. Hi Melissa! I'm also a vol. 12 designer and I'm just popping around to visit all the other blog tour participants. Your Queen of Hearts block is just so fun! I love when a block creates a secondary design :o) Congratulations on a great design! I'd like to find a few 12" blocks to put together into a sampler quilt! That's a great block, and a fun requirement for comments! How about this...my father has 12 siblings!